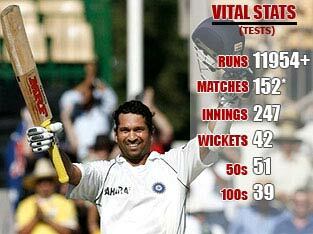 Sachin Tendulkar’s new world record – beats Brian Lara for most test Cricket runs! | Cafe Arjun - 15 times WordPress Top Blog! Sachin Tendulkar’s new world record – beats Brian Lara for most test Cricket runs! Today was another historic day in the life of “Cricket”, the game. India’s Sachin Tendulkar became the man to score the most runs in test Cricket overtaking Brian Lara of West Indies. Also hitting his 50th test Cricket half century, Sachin Tendulkar and India had two reasons to smile. In the ongoing test series against Australia (led by Ricky Ponting), this was day 1 of the second match. When Tendulkar came to bat, he needed 15 runs to beat Brian Lara’s highest runs in test Cricket world record of 11,953 runs. He did that in style with a smooth glide towards third man on the first ball after the tea break. Scoring 88 in a hundred and eleven balls, Sachin Tendulkar now stands at a whopping 12,027 runs and an average well over 50 – 54.17 to be precise. Sachin Tendulkar - World record for highest runs in test Cricket! With no overconfidence or self-appreciation and as usual, he talked about the match and team spirit. Thats what makes this man a real master blaster. Rocky Ponting, the captain of Australia (who was the first to congratulate Sachin today), is potentially the only active Cricketer in the world who can beat Sachin Tendulkar’s world record. Ponting, with 10,239 test runs is number 6 in world rankings of all time test run scorers. What needs to be understood when the press makes statements like this is: If Ponting will score, will Sachin just sit idle? Our master blaster probably will hold the record for the highest number of test runs forever! What also needs to be mentioned in this articles is that dada – Sourav Ganguly also reached 7,000 test runs in this match. Congrats to you too Dada! We love you too! ← Joe “the plumber” Wurzelbacher from Natural Law Party is Charles Keating kin? Sachin Tendulkar has shown the world that he still exists. You need to salute the master! Hats off to the champ! Tendulkar is the best there ever was in Cricket, I don’t want to believe that Ponting will ever break tendulkar’s record, but if Sachin retires from test cricket, then it all depends on how long Ricky Ponting stays in test cricket. I think Ricky still has to cross 2000 runs and thats not easy. Sachin, we are all very proud of you. You live in every Indian’s heart. please gave your moble no….